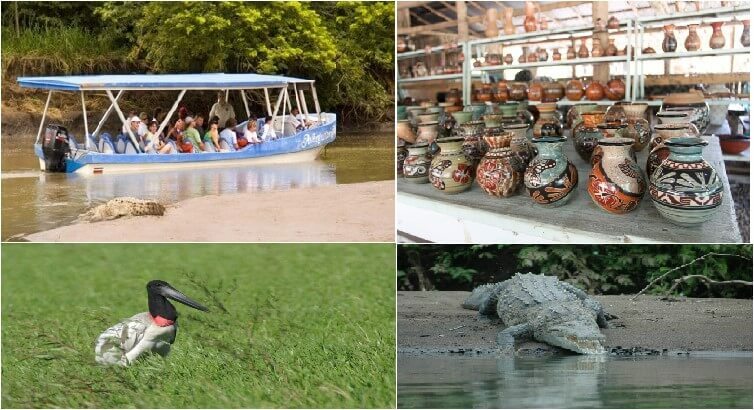 At only one hour and thirty minutes from Tamarindo is the Palo Verde National Park, the largest wetlands in Central America and home to over 200 species of migratory birds among other fauna such as Crocodiles, monkeys and Iguanas. Its importance is such, that it was added to the world patrimonial list of Ramsar. A two hour boat ride will take you to the riverbanks and to the river’s edge where often white faced monkeys will approach the boat and where you can observe the plethora of birds that have come here to flee the cold weather up North (who can blame them?) If you are a bird and nature lover, this is the place for you to visit. ​Once we get off the boat you will be served a delicious Costa Rican lunch at a local restaurant. ​We offer the option to include a visit to the pottery village of Ortega where you can purchase some locally handcrafted pottery and therewith support the local artisans. Tip: We highly recommend this excursions for young families and nature lovers. Includes: A/C Wi-Fi round trip ground transportation, 2 hour boat ride, private bilingual tour guide, Costa Rican style lunch, refreshments, free demonstration of pottery history and manufacturing. Tennis shoes or sandals light clothes (shorts), sun block, hat, camera (binoculars) and bug spray.